The Arabic word Sabi means baby boy, and this is why Maqam Saba - צבא - is used for the Berit Milah (circumcision). Saba is used for Torah portions that contain either births, covenants (berit), a multitude of laws, or the reference to an army (Hebrew: Saba). The Jews of Damascus use this maqam to express sad events. Baqashot 56.6 יוצר הכל למי יחפוץ ישראל חזק Damascus tradition only. Saba or Bayat. 1618 יגה שביב אישך Saba and Rast. 1689 שיר לידידי כנגד בית קודשי שמואל חזק Saba or Sigah. 1721 ימי חורפי אהבתני ישראל חזק Saba. Sigah. 4845 הודו נא עם בר יום מועדי Ezekiel Hai Albeg Honoring Naftali A Tawil. 4846 יה בא לאפריון Ezekiel Hai Albeg Honoring Morris J Bibi. 4847 יעירוני רעיוני Ezekiel Hai Albeg This song is from Rabbi Yehuda HaLevi of Spain. 4848 לי יה לי יה יבנה יה Ezekiel Hai Albeg Honoring Isaac David Cohen. 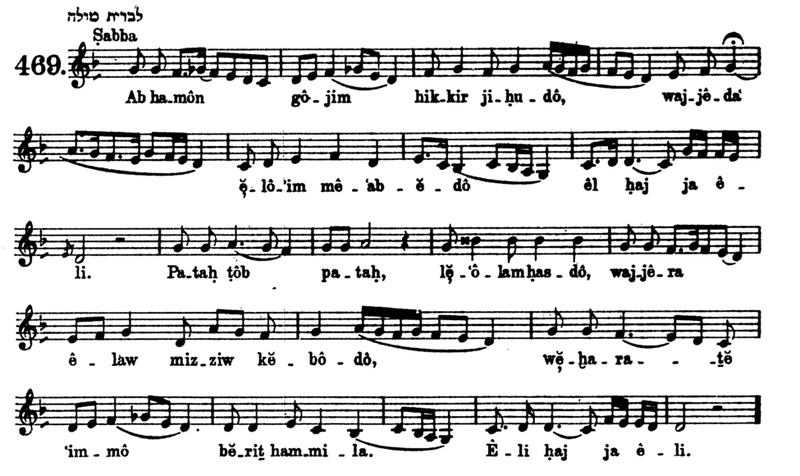 Same melody as page 426a.